Welcome to Hawkins Coffee, delivering coffee to the south west. 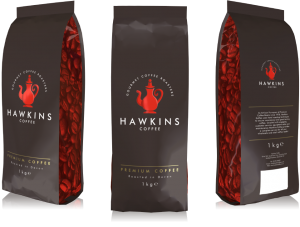 Hawkins Coffee Limited is one of the few Coffee Roasters in the Westcountry roasting, grinding and packing. Fresh Coffee on-site specifically to your order from only the finest grade 100% Washed Arabica Beans. Hawkins Coffee was established in 1978 by Richard Hawkins who started roasting coffee in Kingsbridge in the South of Devon. He was driven by a determination to get the best taste out of the best coffee beans. We took over the business in April 2001 and with the same determination and obsession with quality which has enabled us to grow the business from 5 tonnes to 45 tonnes of roasted coffee per year by the end of 2007. Over the years we have perfected our hand roasting techniques to ensure our coffee is uniquely great! We are 100% confident that, when an experienced barista pulls a shot of espresso made with our fresh hand roasted beans, you will get a true sense of what coffee should be: a concentrated, dark and almost sweet flavour that delivers on the promise of its exciting aroma. At Hawkins Coffee we invest a great deal of time and money in hand roasting some of the world’s finest coffee varietals. That’s why we work to maintain our standards right up to the point where you serve our coffee to your customers. It is very true to say that even if we produce the best coffee in the world, you can ruin our reputation in minutes by serving just one bad coffee. That’s why we have a complete service and training package for all our customers to ensure everyone enjoys “The Hawkins Coffee Experience”.